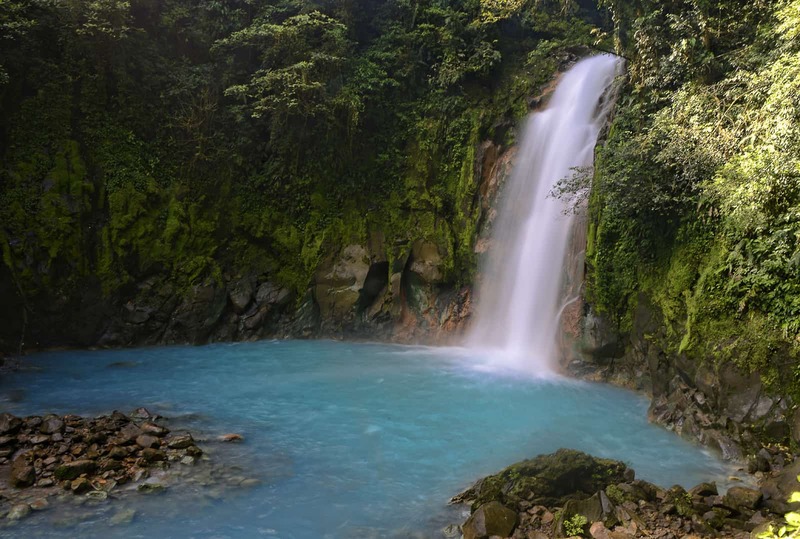 The turquoise tones of Río Celeste (Spanish for “Blue River”) – one of Costa Rica’s most prominent natural jewels – “is mostly an optical phenomenon, not a chemical effect in the water,” a research team formed by experts from the University of Costa Rica (UCR) and the National University (UNA) reported this week. For years many have speculated as to the cause of the coloring, and until now the most accepted version was the river’s proximity to Tenorio Volcano, in the northwestern province of Guanacaste, which meant that the turquoise color of the water was due to a high concentration of minerals, particularly copper sulfate, calcium carbonate and sulfur. The new study’s results, disclosed this week, indicate the coloring is not caused by a chemical substance tinting the water, but rather it is a perception created by the scattering of sunlight and reflected by the riverbed. Río Celeste’s bed is formed by waters from two completely transparent rivers: Quebrada Agría and Buena Vista. At the junction of these two rivers, Río Celeste’s water turns turquoise along its 14 kilometers. During the investigation, UNA and UCR scientists took several samples of water from the two rivers and concluded there is no copper or any other metal dangerous to humans. Instead they found that a combination of other minerals present in both rivers create the layer of aluminosilicates that cover most of the rocks on the riverbed and are responsible for the optical effect. The conclusions of Tico scientists were accepted by the scientific journal “PLOS ONE,” which will publish them soon. Researchers from both universities also are working on a training program for tour guides in the area so they can properly explain to tourists the effect that is created in the human eye by the famous waters of Río Celeste.